OK, after my more than usual serious post on Saturday, and I do appreciate all the encouraging and positive words of encouragement more than you know....I am back to my more light-hearted self. Ask me what I have done today, just come on ask me. I filled up the birdfeeder before our whoopin' snow storm a week ago Sunday. I know I am always a little behind in doing this, should have been hung and filled in early winter but I figure as long as there is bare ground and seeds on the trees the birds probably have enough to eat. Now that the ground is covered in white, I'm thinkin' they would appreciate their local diner to open for the winter season. I guess the birds thought the diner was closed for the season because it took them darn near a week to realize it was open for business. So this AM I have been standing at the window, (which really needs a good cleanin') still in my PJ's and robe, snapping away. You won't see any pics of sparrows in this group. Sparrows are the most populous bird in this area. Maybe they ought to pass a law like they did in China limiting a family to only 2 children per household nest, up 1 from when the law was passed in the 70's stating that each family could only have one child. Somehow I don't think the bird world would adhere to that mandate. I know this is some kind of woodpecker, when I searched the internet I just got more confused. There is another one that has red on it's breast that I have seen but haven't been able to catch her/him in my lens. Not sure what this is either, I think some kind of a wren. 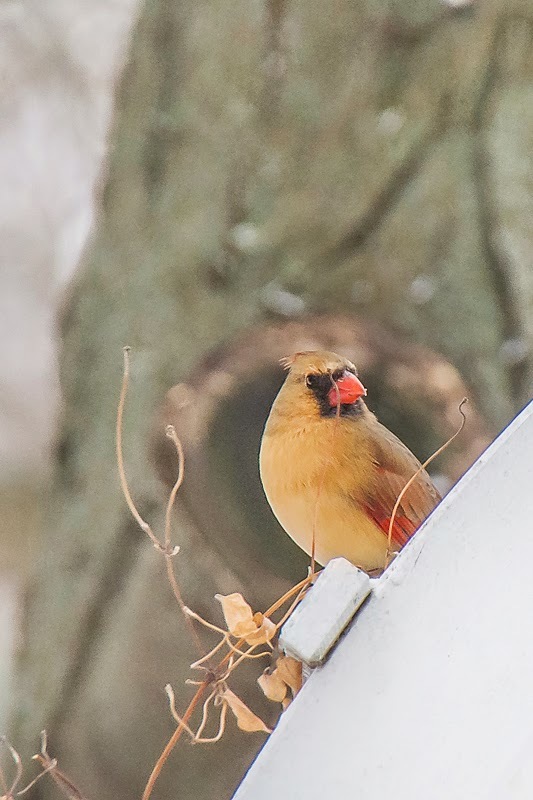 Not crazy about the non-sharpness, but was excited to see this rarely seen bird in my yard. 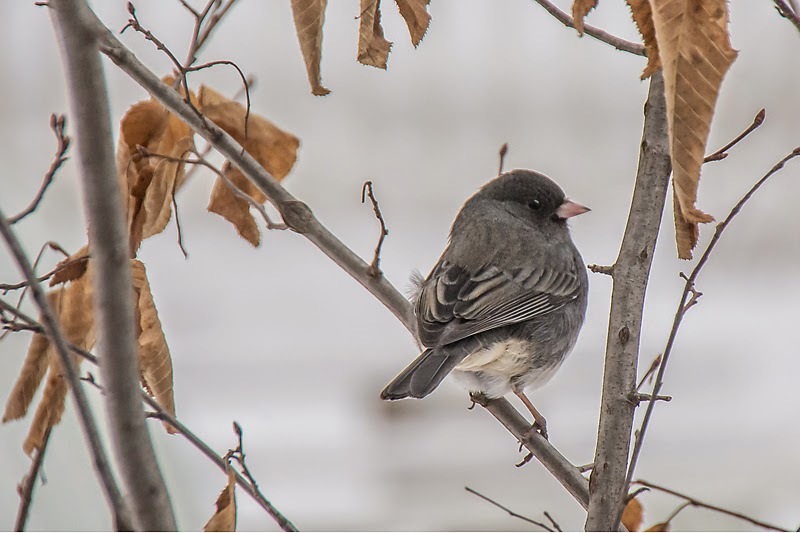 And the Junco's so sweet, only see them in the winter-time here. 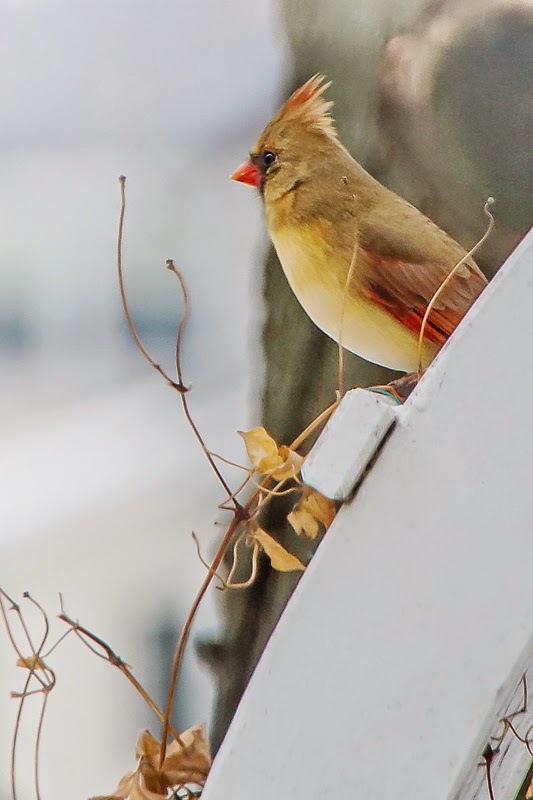 And then Mrs. Cardinal landing on the trellis. She stayed for quite awhile, and just like a woman kept turning to make sure I had her best side. And now a week later and after the snow has melted quite a bit, Cinder is much more willing to go outside. She can maneuver through the banks and trails. female red-bellied woodpecker and a white-breasted nuthatch. :) cute little cinder! Yep, what TexWisGirl said, I concur. I went on a walk on the birding trail and saw, osprey, hawks, a pileated woodpecker, a king fisher, cardinal, chickens (lol-yes), whistling ducks, great blue heron, white egret....of course most of them were really out of good reach with my lens but fun to see none the less! Tex beat me to it...whch she is the one who taught me the difference between male and female red-bellied woodpecker. Nice captures, by the way. A puppy in a sweater, so cute!! Love the birds - I am so missing greenery and wild life! lovely shots of the birds! Love cinders cute sweater and she does look pretty happy outside . Nice captures of the birds. I'll bet they're grateful for the filled feeders. Hello, little Cinder! Such a sweetie pie. These are all great shots- and so nice to see out the window! 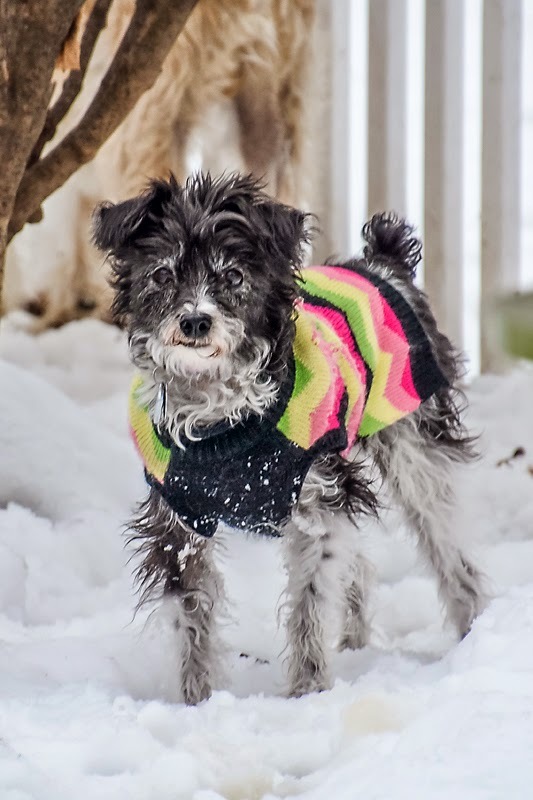 Cinder looks a bit chilly, but adorable in her sweater. Love your bird pictures. I think the only birds I've seen for months are pigeons. Keep cozy! oh how i love sweet little backyard birdies. we have some of those in our neck of the woods too although our juncos only come around in the winter. but after our warm snap, i've started seeing more robins and hearing the mourning doves. I filled my feeder this morning and by noon it was empty. At first I thought it was the deer again, but Mr. Squirrel has finally decided to come out of the woods and scamper across the open areas to the feeder...he's cute, but will cost me a fortune in seed. I might have to put Bugsy on guard! 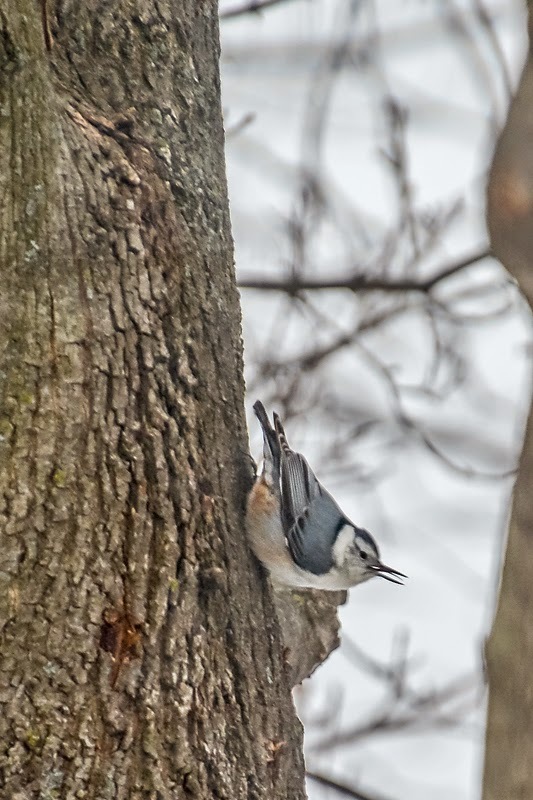 I love the nuthatches...such a pretty bird! You write and share photos in such a great style . . .
and the Wayne Dyer quote goes along perfectly . . . I love little Cinder looks . . . Seeing all those birds does give me hope for spring when the fair-weather birds will also return. This is the first year we've done a bird feeder, right off our back porch door. But every time I open the inside door, darned if those little critters don't hear it and scurry away. When it gets a bit warmer, I'll have to just wait for them on the porch. Your bird photos are always splendid. I really enjoyed seeing all your photos of Birds. I do love the black eyed Junco.. And the one of Cinder is so sweet. You know I never seem to know the names of birds and it doesn't matter because I just enjoy them for who they are. 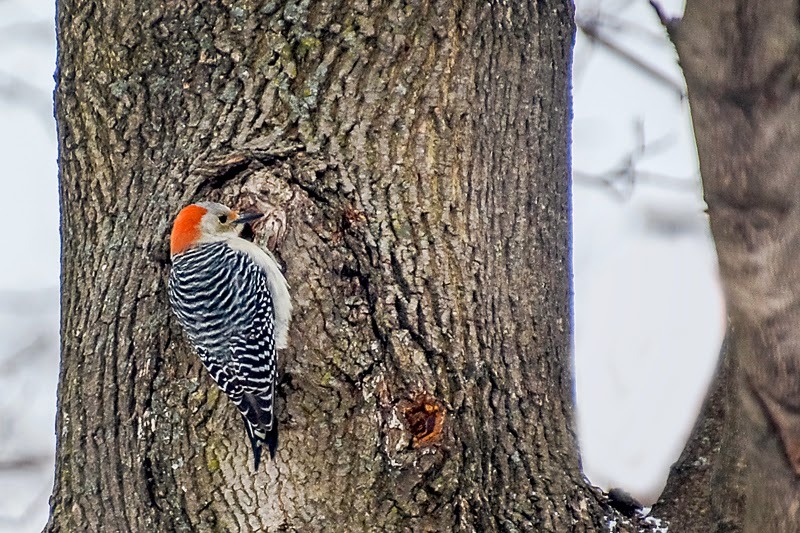 I love the pretty woodpecker here, the bright red stands out. Also Cinder is just adorable looking out there in the snow.